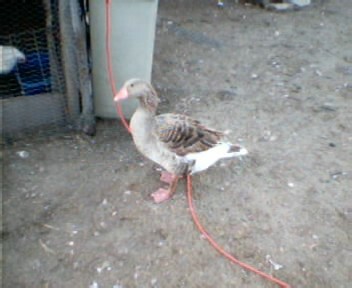 We currently have TOULOUSE geese, but will be adding more soon. 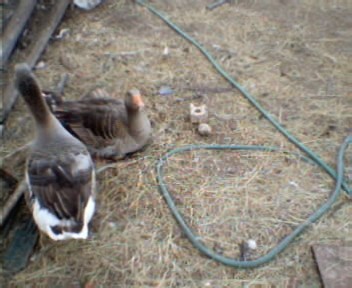 Geese are EXCELLENT "watchdogs" for the barnyard. If there is anything amiss, geese will let you know. Geese can also become your good friends, ours follow us around and "talk" to us when we talk to them. Geese do NOT need a pond to swim in, a shallow plastic "kiddie pool" will suffice, geese need enough water to submerge their heads in. 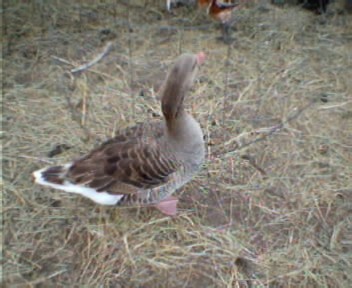 Geese also require a NON-MEDICATED game bird starter feed. Orders of geese must be in increments of 8 goslings to assure safe delivery. boy it does sometimes gets confusing. Their desigantions are 1 of 4, 2 of 4 , 3 of 4, and 4 of 4. Tercheriary adjuncts to unimatrix Honk Honk. 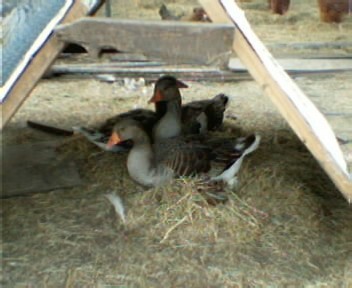 A simple A-frame is the goose "house"